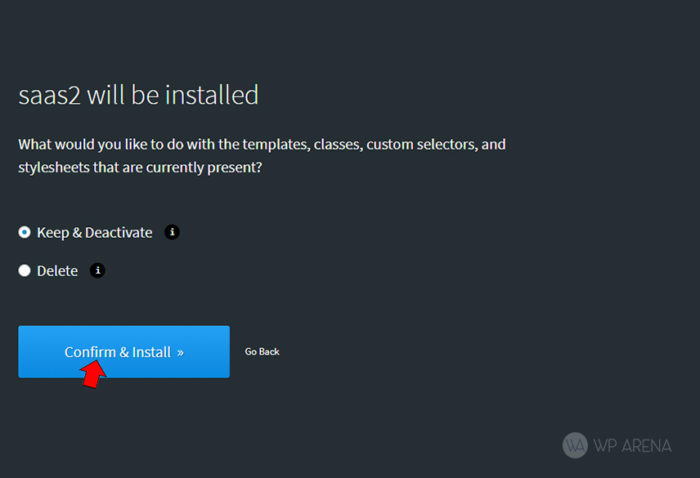 A website builder lets you do all the work without coding. You may find many website builders in the WordPress catalog of plugins, but there’s no alternative to Oxygen builder v2.1 right now. With other website builders, we have to look at every aspect of designing a website, from the level of customization they offer to the simplicity and ease of use. With Oxygen builder 2.1, you get both in one package. It provides a new level of customizations to the end user and makes the hard work simple and easy. Here is my Oxygen builder 2.1 review. What’s new in Oxygen 2.1? Oxygen 2.0 was a massive update to the page builder; however, the new version comes with new features. The new version comes with global colors feature. Before this feature, it was difficult for a user to change the exact color everywhere, now, global colors feature saves your time by making it possible with a click. There is a new post type manager in v2.1 with overlay header and advanced custom fields integration features. Oxygen builder now also supports background gradients and full-screen sliders. It also comes with HTML5 Tag choices, shortcode wrapper, and toolset integration. From the previous version, the team improved the header builder and sliders in the new release. Overlay header saves you from custom CSS. Now you can add overlay headers with ease using Oxygen visual editor. You can add custom overlay headers on different pages of your website. Also, you can use multiple header styles on the same website depending on the style of the page. The global color feature will save you a ton of time. In the previous version, you have to change all the colors which cost much time manually. Now, you can set a global color, and it works like a charm. You can define a global color palette and use it within your website. The changes will appear everywhere with just a click, and it saves time and you from getting frustrated. Oxygen builder now has a compelling advanced custom field integration. You can now link advanced custom fields with design and insert dynamic data from the visual editor. Without coding, you can visually link dynamic data from custom fields with ease. The toolset integration is the same as the advanced custom field integration. 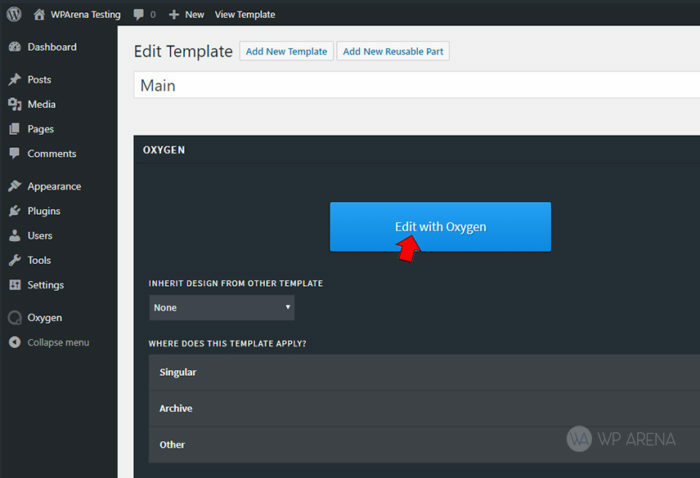 With just a click, you can embed toolset views in any design of Oxygen. Also, it lets you pull values from toolset fields. Now, you can assign roles to people easily in Oxygen 2.1. You can grant No access to Full access from within the settings. 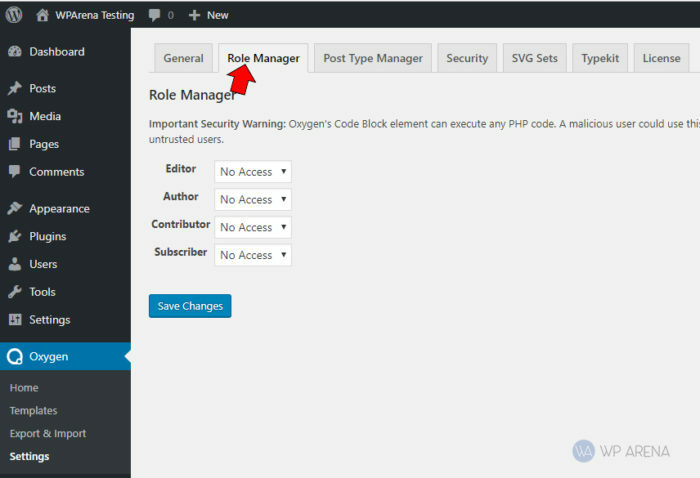 Navigate to Oxygen > Settings > Role Manager to change user roles. Revoking access will stop the particular user from messing up with Oxygen builder, but they will have full access to other WordPress features. Post type manager lets you hide oxygen where you don’t need it to show up. With the new gradient background functionality in Oxygen builder, you can create astounding gradients. Other website builders restrict to usually two colors, but with Oxygen builder, you can play with different colors and create amazing custom effects. It’s more effective and intuitive than a typical post editor. In 2.1, you also get support for HTML5 tags. It helps search engines to understand better and parse your site. HTML5 semantic elements in Oxygen 2.1. These tags describe the search engines about the page and website. Shortcode wrapper feature lets you wrap Oxygen builder designed content with a shortcode. You can wrap div content, make it private or customize it the way you want just using a shortcode wrapper. Oxygen 2.1 now supports Full-screen sliders. You can make sliders full screen and adjust height, margin, and widths accordingly. You can also play around with animations like before. New release of Oxygen improves header builder tool. You can edit and customize the header of your website with more features. Also, the overlay header allows you to do more customization in the header section of your website. New Oxygen builder also improves sliders. With the addition of full-screen slider support, sliders are now more customizable than ever. After completing the purchase of oxygen builder, you’ll get a license key, copy the key and save it. The key is important, and we will later use it to activate the plugin. Click on “Upload Plugin” and then choose the oxygen.zip file which you downloaded from Oxygen’s website. After the installation is completed, click Activate Plugin button to activate the plugin. 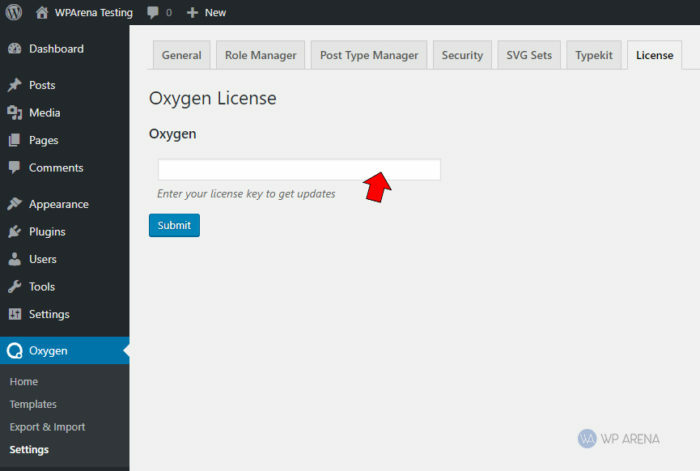 Now, it’s time to activate the plugin with the license key, Navigate to Oxygen Menu > License in the left sidebar. Copy the license key you saved and paste it. It is vital to add license key so that you get all the updates. After activating the main plugin, you can repeat the license key process to gain access to prebuilt components. Now you have it all. Remember, oxygen builder restricts the theme that you are using and builds a website over it. You can visually customize your site with just a few drag and drops and create astonishing web pages out of it for your readers, customers or employees. So, let’s take a look at how it works. 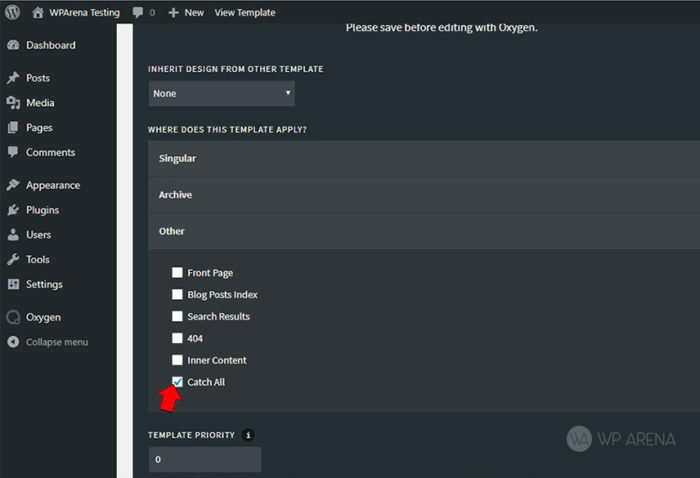 Many built-in templates are there in oxygen builder. You can start by choosing one or just select blank to create your template. Oxygen disables current theme and will overwrite whatever you have installed, so, keep it in mind. Instead of selecting a pre-installed design, we selected a blank template so that we can build a website from scratch. To create a new page, click Pages > Add New. After creating the page, publish it and you will see oxygen builder metabox with different options. Now, select catch-all to apply design to all the pages. Now, you have a new page. After creating a page, you can set the title, slug and publish it. Click the blue button which says “Edit with Oxygen” and a visual editor will open. If you do not see “Edit with Oxygen,” it is because you’ve turned it off in “Post Type Manager.” Navigate to Oxygen > Settings > Post Type Manager and uncheck the options where you want Oxygen builder to show up. Now, there’s a blank page in front of you if you select blank while choosing the templates. On your top left corner, there’s a blue +Add button, click it, and different tabs will open in front of you. These components of Oxygen builder let you build eye-catching websites without coding skills. The basics tab contains different containers, text, links, visuals, and code block components of the website. Click on any one of it and add it to your web page. Helpers are loaded with composite, dynamic, interactive, external components of the website. These components include sliders, images and google maps integration. The WordPress tab is full of widgets, forms, shortcodes, search forms, sidebars, and dynamic data options. Library tab contains design sets of different templates from Oxygen builder that we can use to create websites. You can find all the prebuilt elements here. This tab covers ‘inner content’ styles, all the reusable components that you save will appear in this tab. Let’s start with adding a header which comes first in the website. Just select the header and insert it in the page. Now, you have a header, explore settings there and create an appealing look for the header. You can add more elements by exploring the tabs. Add sliders, divs, and text, customize as much as you want and link them. After finishing the design, don’t forget to click the save button and preview your design by navigating to the upper right corner and click Back to WP > Frontend. Similarly, you can create multiple pages and edit it in oxygen builder. Create interactive websites without coding skills. It’s simple and powerful at the same time. Oxygen builder allows you to do much more than a typical WordPress page builder. A product can only become successful if the support team is handling their customers with great care. Oxygen builder’s support team is helping their customers and will respond to your query within two hours. You can drop your questions that aren’t answered in the FAQ on their support page or email the support team. The development team will look at your suggestions and also help you if something is broken. You can also try oxygen builder before purchasing it. If we look at this plugin with the price point, oxygen is affordable of all industry site builders with all features, lifetime support, and lifetime updates. It starts from $129 with 10 sites support. Adding 15 sites will cost you $149, and unlimited sites package costs $199. You don’t have to update your subscription anytime. Just pay once and get lifetime updates. Also, one of the things that are attractive to me about Oxygen is they are offering a 60-day money back guarantee. The team is confident in their product that they will give you a refund if you are unhappy with their product. After thorough testing of different WordPress page builders and Oxygen builder 2.1, it’s not hard to conclude that Oxygen builder is the most powerful of all. In our previous review of Oxygen, it was the best website builder out there. With the release of version 2.1, it’s even better than it was. The new improvements are worth the wait and more features are coming in new releases. I’m confident in saying that it’s intuitive and perform way better than other website builders in the industry. A person with no experience of coding can create a visually appealing website that is both powerful and aesthetically beautiful. The site built with Oxygen is also light and doesn’t affect the performance on any device. Minimum CSS and JS files reduce the load time. You can use Oxygen plugin on any website. Get your package of oxygen builder now from here. Very useful content for self web developers. It should be noted that you cannot use this with themes such as Genesis, Astra, Generate Press, and Ocean WP. Oxygen is geared more for those who are looking to create new websites, and not for those with existing sites. This could change in time, but that seems to be the case at the moment.